On May 5 and 6, Aboriginal Physical Activity & Cultural Circle (APACC), teamed with UBC and Indigenous Studies in Kinesiology to host the 2018 National Indigenous Physical Activity & Wellness Conference. Community leaders and advocates met with the goal of discussing how to get Indigenous youth more physically active through sports and traditional practices. Dr. Rosalin Miles, research associate in Indigenous Studies in Kinesiology and member of the Lytton First Nation, spoke about the challenges that Indigenous youth face when looking to participate in organized sports, particularly in remote communities. “The biggest barrier is parental support — having people that are available to help coach, [provide] transportation and be healthy role models to make sure their children are being active,” said Miles. Dr. Miles spoke about the minimal funding support available to youth who’d like to get engaged in sport, and that many communities have turned to fundraising to offset transportation and equipment costs. Congratulations to the conference hosts for putting on such a successful and stimulating event. 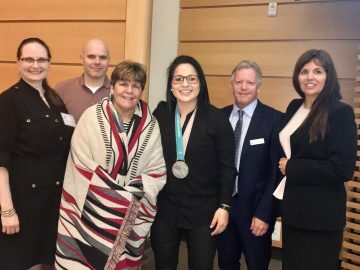 From left to right: Dr. Shannon Bredin, Dr. Moss Norman, Elder and past Musqueam Chief Gail Sparrow, Olympian Brigette Lacquette, Dr. Robert Boushel, and Dr. Rosalin Miles.